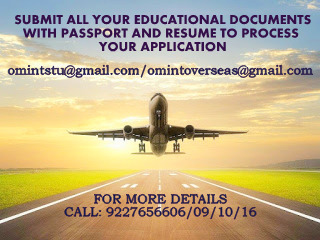 OM VISA Consultancy - Global Immigration, Students, Visitor, Business & Work VISA Consultants: 5 UNIQUE PROGRAMS INTRODUCED BY CANADIAN COLLEGE, with the help of Om International the leading visa consultancy. 5 UNIQUE PROGRAMS INTRODUCED BY CANADIAN COLLEGE, with the help of Om International the leading visa consultancy. · Located in the heart of downtown Vancouver on Alberni Street alongside high-fashion retailers, top restaurants and famous hotels. · Offers fixed classroom schedules to students for just 3-4 days a week keeping in mind the fixed working schedule of students. · Providing education to 400+ international students from over 20 countries. Overall 6.5 with no module less that 6.0. Overall 6.0 with no module less that 5.5. Students enrolled in these programs will get two transcripts and two diplomas, one from St. Lawrence College and other from Canadian College.